Today marks the 60th anniversary of the death of the Greek writer and philosopher Nikos Kazantzakis, in Freiburg, Germany, on 26 October 1957. To mark this anniversary, the Greek Ministry of Culture has declared 2017 as the ‘Year of Nikos Kazantzakis.’ The proposals to mark the year in this way were first put forward by the International Society of Friends of Nikos Kazantzakis (ISFNK), the Hellenic Department of the International Society of Nikos Kazantzakis, the Nikos Kazantzakis Museum and the Kazantzakis Publications. 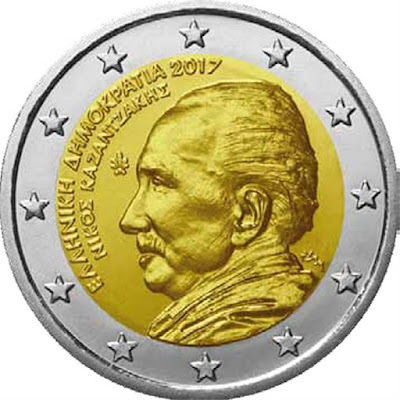 The cultural events marking the year include a World Literary Competition named Kazantzakia, organised by the International Society of Greek Writers and Artists, and the Greek government has issued a new €2 coin. Nikos Kazantzakis (1883-1957) is a giant of modern Greek literature, and he was nominated for the Nobel Prize in Literature on nine separate occasions. His books include Zorba the Greek, Christ Recrucified, Captain Michalis (also published as Freedom or Death), and The Last Temptation of Christ (1955). He also wrote plays, travel books, memoirs and philosophical essays such as The Saviours of God: Spiritual Exercises. His fame spread in the English-speaking world because of the film adaptations of Zorba the Greek (1964) and The Last Temptation of Christ (1988). President Prokopis Pavlopoulos attended the workshop, and the speakers included the historian and archaeologist Giouli Ierapetraki, of the Hellenic Department of the International Society of Friends of Nikos Kazantzakis, and the writer Nikos Chrysos. Last week, there was a public lecture by his adopted daughter, Dr Niki Stavrou, in University College Dublin. For Cretans, his outstanding works are his autobiographical but posthumous Report to Greco (1960) and his Freedom and Death (1946), set in Iraklion during the struggle against Ottoman oppression. Freedom and Death first appeared in Greek as Captain Michailis, and the eponymous hero is the author’s own father. The characters are the people of 19th century Iraklion, the settings are its streets, churches, fountains, mosques, and houses. His epic version of the Odyssey occupied Kazantzakis for 10 years. But his other work includes poems, plays, travel books, encyclopaedia articles, journalism, translations, school textbooks and a dictionary. In his later years, Kazantzakis was banned from entering Greece for long periods, and he died in exile in Germany on 26 October 1957. When his body was brought back from Freiburg, the Greek Orthodox Church refused to allow any priests to provide rites or ceremonies in Athens. 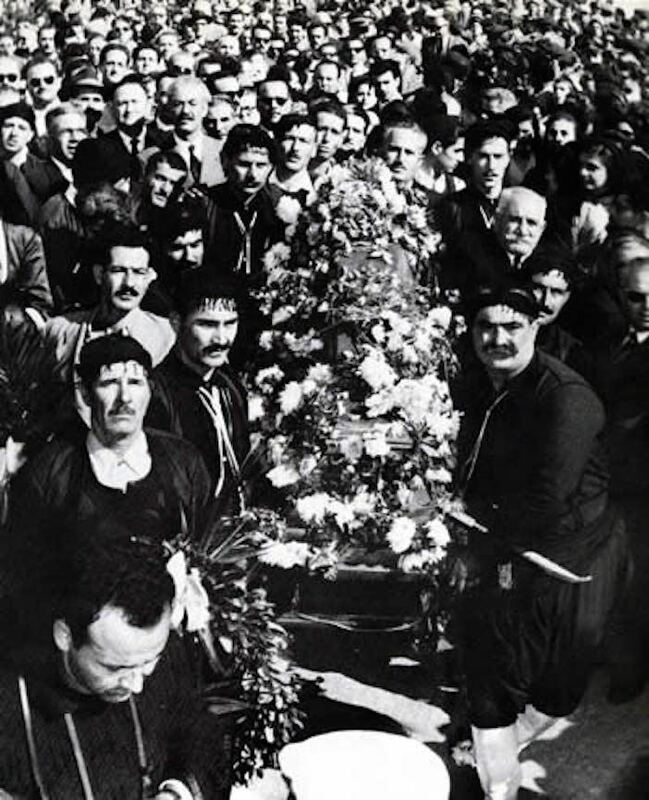 Western writers often claim Kazantzakis was denied an Orthodox burial because of his unorthodox views, or because of The Last Temptation. But Aristotle Onassis provided a plane to take his coffin to Iraklion, and Kazantzakis laid in state in the Cathedral of Aghios Minas. Those who came to pay tribute included the Archbishop of Crete and the resistance leader and future prime minister, George Papandreou. My friend Manolis Chrysakis, the proprietor of Mika Villas, a popular destination in Piskopiano for Irish tourists, denies his great-uncle was ever excommunicated by the Greek Orthodox Church, and insists he was never disowned by the Church of Crete, which is semi-independent and under the direct jurisdiction of the Patriarch of Constantinople. Manolis and his family in Iraklion and Piskopiano are proud of their kinship with Nikos Kazantzakis: they are descended from the sister-in-law of ‘Kapetan Mihailis,’ the eponymous hero of the Kazantzakis novel based on his father’s adventures and published in English as Freedom and Death. Kostas Chrysakis treasured his photographs of his uncle’s funeral. They show men in traditional island costumes, like Dirk Bogarde in Ill Met by Moonlight, in a procession led by robed Orthodox priests through the narrow thronged streets up to the city walls. Although Kazantzakis was denied church ceremonies in Athens, when his body was flown to Crete by Aristotle Onassis he lay in state in Aghias Minas Cathedral in Iraklion, and a priest officiated at the burial, giving lie to the popular claim that Kazantzakis had died an excommunicate. Kostas claimed that when the Vatican and the Archbishop of Athens demanded the excommunication of Kazantzakis following the publication of The Last Temptation of Christ, the Patriarch of Constantinople insisted that the Church of Crete was independent. A year later, a priest led the traditional family prayers at the graveside on the southernmost bastion, built by the Venetians in the 16th century. During a recent summer, while I was visiting Iraklion, I climbed up through those same narrow streets in Iraklion in the warm afternoon sun to visit his grave on top of the great walls and bastions that were part of the Venetian defences of the city they called Candia. Two of the great city gates have survived to this day: the Pantocrator or Panigra Gate, also known now as the Chania Gate (1570), at the western edge; and the Jesus Gate or Kainouryia Gate (about 1587), at the southern edge. At the south-west corner of these great walls, the grave of the writer is on the Martinengo Bastion. These days, people from Iraklion like to gather on the Martinengo Bastion at the weekend, to get a free view of the football stadium below, and to pay their respects at the tomb of Kazantzakis. Below the bastion is a monument to Iraklion’s partisans who resisted the Nazi invasion of Crete during World War II. From the top of the bastion there are splendid views. To the north, the roofs of the city lay below me, pierced by the dome and the baroque towers and turrets of Aghios Minas. Beyond, the blue of the Mediterranean stretched out to meet the blue of the sky on the horizon. To the south is Mount Iouktas – it looks like the head of a man in profile and so is said to have given rise to the Cretan legend that this was the head of the dead and buried god Zeus. Kazantzakis inherited the islanders’ healthy scepticism towards religious and political dogmas.